- موقع الطريق المضئ ينشر لكم تحميل شرح وملخص وبنك اسئلة لقصة بلاك بيوتى منهج اللغة الانجليزية, الصف الثالث الاعدادى,المنهج الجديد المرحلة الاعدادية. 1 – Who is the author of the story? 2 – Who is the narrator of the story? 3 – With whom did Black Beauty live? -With his mother and some horses. 4 – Who was the first owner of Balck Beauty? 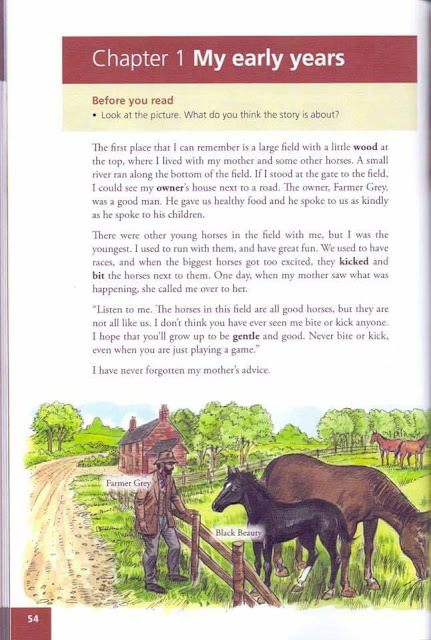 5 – How was farmer Grey a good man? -He gave them healthy food and spoke kindly. 6 – Who was the youngest horse ? 7 – What did Black beauty and other horses use to have? -They used to have races. 8 – What did the biggest horses do when they got excited? -They kicked and bit other horses. 9 – What did Black Beauty’s mother advise not to do? -Not to bite or kick even when just playing. 10 – Describe Black Beauty when he grew up. -He grew tall, strong with a black coat with one white foot and a white star on head. 11 – What did he learn to do? -He learnt how to pull a carriage. 12 – What advice did his mother give when he grew up? -She said the harder he worked, the kinder people will be to him. 13 – When did farmer Grey decide to sell Black Beauty? 14 – Who was the new or second owner of Black Beauty? -He was Squire Gordon who lived in Birtwick Park. 15 – Who looked after Black Beauty? -John Manly, Gordon’s kind helper. 16 – Who were Black Beauty’s new friends? Merrylegs who was small, fat jolly and gentle. Ginger who was tall with sad face. 17 – Why did ginger often kick and bite? Because people weren’t nice to her in the past. 18 – Why did Merrylegs make children laugh? Because of the way he walked. 19 – What did the children bring Merrylegs? They brought him apples and nice things. 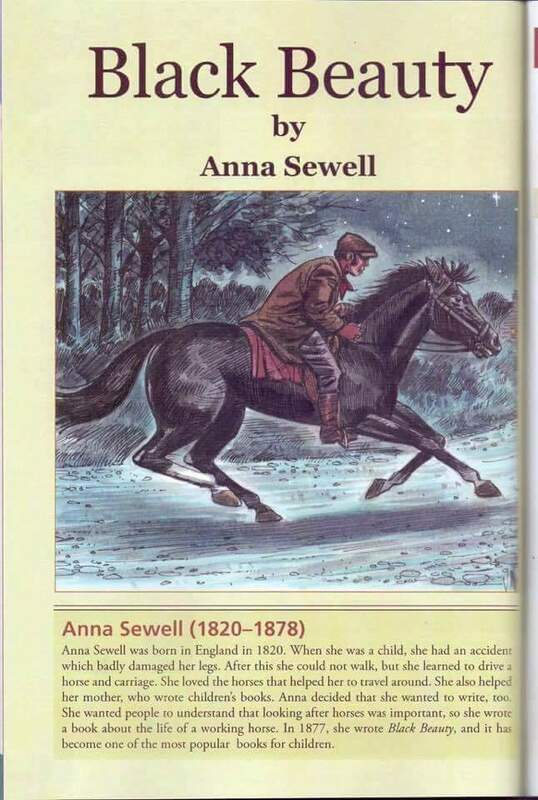 20 – Why didn’t the children visit the horses any more? Because they knew that Ginger bit people. 21 – What did Gordon’s wife say about Black Beauty? She said he was a perfect horse. 22 – What name did the wife suggest for the horse and why? She suggested calling him Black Beauty as he was handsome. 23 – What did Merrylegs say about Ginger? He said that she was sometimes bad-tempered. 24 – What did Ginger say about people she worked with in the past? She said that they were not kind and cruel. 25 – What was Ginger’s problem with people? Some people hit her hard when she refused to do things. 26 – Why did the people decide to sell Ginger? Because she started to bite and kick people. 27 – For Ginger, How did she know that Gordon and John were different from other people? They were kind and gentle with their horses. 28 – What happened that made Ginger think that some people could be good? When Gordon was angry with a man who hit the horse and said that a horse is not a machine. 29 – When did Ginger start to respect Gordon? When he told one of his workers that a horse was not a machine 30 – What did Ginger decide not to do? She decided not to bite or kick people. 31 – When would Ginger be as good as Black Beauty? When people became kind to her. 32 – What bad thing did Merrylegs do one day? He threw children on the ground. 33 – Why did Merrylegs throw the children on the ground? To teach them a lesson because they hit him with a stick. 34 – Why was Merrylegs angry with older children? Because they thought it was a machine and could continue without rest. 35 – Why didn’t Merrylegs kick the children? Because he didn’t want to hurt them and if he did so they would sell him to unkind people. اسئلة على الفصل الثالث من قصة بلاك بيوتى , الصف الثالث الاعدادى المنهج الجديد .